Prewash before Use: All the absorbent parts: nappies and boosters should be washed before use. Firstly to remove any residues remaining after the manufacturing process and secondly to make the nappies and boosters absorbent . Most nappies need to be washed at least three times to achieve absorbency. What Temperature? : Nappies do not have to be washed at 90 degrees and in fact washing at this temperature can ruin some nappies and destroy the waterproofing in the wraps. Many people now wash their nappies at 40 or 30 degrees. A 60-degree wash or adding a nappy sanitiser (such as MioFresh or Napisan) to a 40-degree wash makes your nappies hygienically clean. 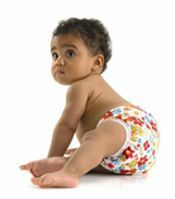 Nappies should be sanitised if your baby is under three months of age, your baby is ill, the nappies are particularly soiled or if you are using the nappies on more than one baby. Biological or non-biological detergent? You have probably already decided which works best for you. The important thing about biological detergent is that the active enzymes in biological detergents are most effective at 40 degrees. Some people don't choose bio-detergents because the enzymes may have been produced by genetically engineered bacteria. Washing Routine: Put the nappies through a pre-wash cycle to remove any soiling (this takes the place of soaking in a bucket). Next run a normal cycle at 60 degrees or less with detergent. Only do an extra rinse cycle if you see bubbles in the final rinse cycle. Don't do an extra rinse when it's not necessary as it will make your nappies hard. Soaking Wraps: Wraps should not be soaked as it reduces waterproof properties. Fabric Softener: Never use fabric softener when washing your nappies as this coats the nappies and decreases their absorbency. Drying: Line dry where possible. Nappies and wraps can be tumble-dried on low (higher for cotton nappies). Manufacturers' Instructions: Please always refer to the manufacturers’ advice for washing and caring for your nappies. Bambino Mio MioFresh – use sparinglyProblems? If you have any problems with leaking or detergent build-up, then please refer to our Tips & Troubleshooting Guide or the Residues Information. Funk Rock is especially formulated to clean stinky nappies. In hard water areas some natural fabric nappies can become hard and ‘crunchy’. To soften your nappies, rub them together to reactivate the fibres. Alternatively put them in the tumble dryer for 10 minutes before hanging them out to line dry. One other unusual but effective way is to collect some rain water and soak your nappies in the rain water before putting them through a final spin in your washing machine. If you need any more advice, then please call or email us or drop by and see us.